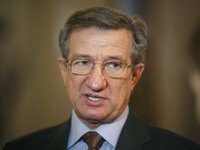 Independent member of Ukraine's Verkhovna Rada, former head of Donetsk Regional State Administration Serhiy Taruta says that if continued, the blockade of transport infrastructure in Donbas will have catastrophic consequences for Ukraine's economy and Ukrainians' wellbeing. "The national budget will fall short of about UAH 35-40 billion [$1.29-1.48 billion] in taxes; receipts in foreign currency will shrink by $2.5 billion. All this will weaken the hryvnia, which will, unfortunately, make every Ukrainian poorer," he told on ICTV. He claims that "militants and Russia benefit" from the blockade of transport communication with Ukraine. "Militants happened to have a unique opportunity to 'nationalize' these enterprises. Putting it simply: grab, stop their work and dismantle for scrap. Nobody in the 'DPR' [self-proclaimed Donetsk People's Republic] and the 'LPR' [self-proclaimed Luhansk People's Republic] thinks about any future. ['DPR' leader Oleksandr] Zakharchenko and ['LPR' leader Ihor] Plotnytsky are thinking only about one thing: how to capture booty by cutting enterprises for scrap - this is the militant leaders' own business," Taruta said. He estimates that about 80% of small-, medium- and partly large-scale industrial enterprises that are located in militant-controlled territory could be turned into scrap. "Russia now supplies metal to the markets where Ukrainian exports were earlier sent, thus depriving Ukraine of its traditional sales markets. The blockade is another form of the hybrid warfare," he added.